Marcus Aurelius Severus Alexander was originally named Alexianus. He was born about 208 AD. Alexander was the son of Julia Mamaea and Gessius Marcianus. At the insistence of his grandmother, Julia Maesa, Severus was adopted by his cousin and was adopted by his cousin Elagabalus in 221 AD making him the legal heir to the throne. Simultaneously, Severus was raised to the rank of Caesar. 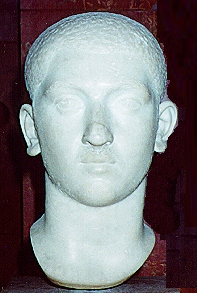 After the murder of Elagabalus, Alexander was acknowledged as Emperor by the Praetorian guards by the insistence of his grandmother Julia Maesa. The Senate confirmed his position the following day. Under the rule of Severus Alexander, the empire seemed to recover. The economic condition of the state was greatly improved. 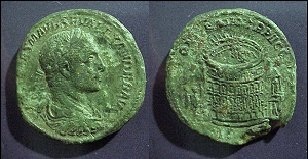 The above illustration is a bronze sestertius announcing the restoration of the Colosseum as one of his public work projects. However, it is during his reign that the first movements of a new enemy were to begin – the Goths. Over the next 50 years, the Goths would devastate much of the Roman Empire driving deep into the Eastern provinces. Herodian tells us that Severus was completely dominated by his mother, Julia Mamaea. Like many of the women from the Severian dynasty, a dominating personality seems to be a strong trait. Herodian went on to remark that Severus “did exactly as he was told. This was the one thing for which he can be faulted; that he obeyed his mother in matters of which he disapproved because he was over-mild and showed greater respect to her than he should have done” Indeed, this problem of being ruled by his mother created much resentment among the army – a factor that no doubt cast his own fate. While the first nine years of Alexander’s reign were peaceful and free from foreign wars, that situation began to change in 232 AD. Alexander was forced to take to the field against the Sassanid Ardashir who had recently overthrown the Arsacid kingdom of Parthia. Ardashir began to threaten Syria and Cappadocia – key northern African territories. Alexander’s campaign against Ardashir met with only limited success. Alexander was soon forced to return to the West where disturbances on the German frontier required his presence. Before the fighting actually began, the soldiers rebelled proclaiming the commander, Maximinus, Emperor. 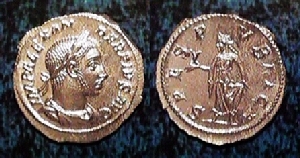 Alexander and Julia Mamaea were both murdered at their camp near Mainz on March 22nd, 235 AD. The official name of the landmark of Rome was Amphitheatrum Flavium named after Vespasian (69-79AD) dynasty. The common name Colosseum was the street name attributed to it not for its size, but because the theater was built next to where the enormous statue of the Roman emperor, Nero (b 37; 54–68 AD) once stood known as the Colossus Neronis . 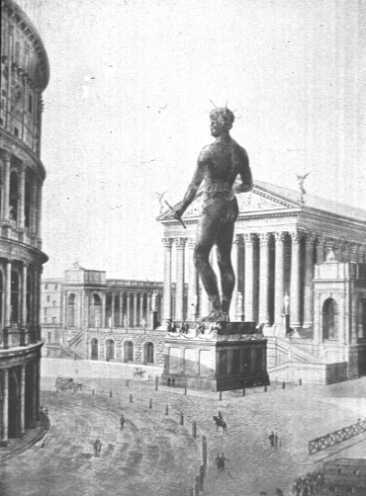 This statue was often referred to as the “Colossus of Nero” and stood and enormous height made entirely of bronze. According to Pliny the Elder, the statue reached 106.5 Roman Feet (30.3 m) in height, though other sources claim it was as much as 37 m.
This construction of the Colosseum was also political for the popular belief that Nero had set fire to Rome so he could build his palace. The unpopular act of Nero clearly justified the redevelopment of that area and this is where the Colosseum now stands today.This enormous statue of the Emperor Nero was created in the vestibule of his Domus Aurea, the imperial villa complex he built, which spanned a large area from the north side of the Palatine Hill, across the Velian ridge to the Esquiline Hill. The statue was placed just outside the main palace entrance at the terminus of the Via Appia in a large atrium of porticoes that divided the city from the private villa. The Greek architect Zenodorus designed the statue and began construction between 64AD and 68AD. Shortly after Nero’s death in 68AD followed by the Civil War, the victor Vespasian, in order to gather the support from the people for the continuation of the Imperial form of government at the end of the Julio-Claudian Dynasty, reclaimed the area and began the construction of the Colosseum and modified Colossus of Nero. The statue was eventually moved to a spot outside the Flavian Amphitheatre and Vespasian added a sun-ray crown and renamed it Colossus Solis, after the Roman sun-god Sol. Hence, the statue of Sol Invictus was popular so much so that the feast day of Sol was December 25th and was thus adopted by the Catholic Church for Christmas because it was a traditional holiday people soon forget why they had the day off. 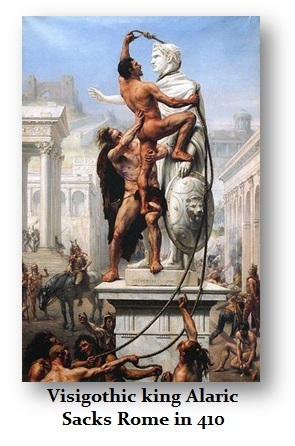 The Colossus of Nero was last mentioned during the 4th century AD. Around 128, Emperor Hadrian ordered the statue moved from the Domus Aurea to just northwest of the Colosseum (Amphitheatrum Flavianum), in order to create space for the Temple of Venus and Roma. It was moved by the architect Decrianus with the use of 24 elephants. Emperor Commodus converted it into a statue of himself as Hercules by replacing the head, but after his death it was restored, and so it remained. The fate of the Colossus of Nero is not certain. It was last mentioned in antiquity in the Chronography of 354 AD, Calendar of 354 AD, was a 4th-century illuminated manuscipt known to have been produced in 354 AD for a wealthy Roman Christian named Valentinus. Today, nothing remains of the Colossus of Nero save for the foundations of the pedestal at its second location near the Colosseum. It was possibly destroyed during the Sack of Rome in 410AD, for it surely would have been taken by the second sacking of Rome in 455AD carried out by the Vandals. They stripped copper from the roof of numerous temples. Perhaps it was toppled in one of a series of fifth-century earthquakes, and its metal scavenged during those hard economic times. There is a remote possibility that the statue was still standing during the Middle Ages since it is preserved medieval poem that says: As long as the Colossus stand, Rome will stand, when the Colossus falls, Rome will also fall. Nevertheless, in essence, the Colosseum got its name from the Colossus of Nero and its construction was the, inaugurated by Vespasian’s son, Titus in 80 AD, and completed during the reign of his brother Domitian. The Colosseum was one of the most remarkable Roman structures to survive to this day, which was designed to seat 50,000 spectators. It had around eighty entrances to speed the attending crowds through — whether they were departing or arriving. Its construction is surprisingly “modern” in its utilization of different combinations of types of construction and materials: concrete for the foundations, travertine marble for the piers and arcades, tufa (a soft and easily worked volcanic rock) as infill between piers and walls of the lower two levels, and finally brick-faced concrete being used for the upper levels as well as for most of the vaults. In 217 AD, early in the reign of Macrinus, the building was struck by lightning and badly damaged. (This was seen as a very ill omen for the tenure of the new emperor, who had replaced the recently assassinated Caracalla, and whose death he was intimately involved in.) By 218 AD the Severan dynasty was once more on the throne, in the guise of Elagabalus, and repairs to the Colosseum were begun. Work continued under Severus Alexander so that by 223 AD the building was sufficiently restored to be used once more be used (work on the structure would continue for well over another decade, to be finished during the reign of Gordian III, who celebrated its completion with a small issue of medallions). In honor of the Colosseum‘s reopening, Severus Alexander struck a very small issue of commemorative coins: a number of bronze sestertii and asses, as small issue of silver denarius and an even smaller issue of gold aurei, of which two are known.